With those limitations in mind, NextGen's strategy to influence the vote is targeting millennials on college campuses, a more Democratic-minded cadre of voters. "Young voters are diverse, progressive, and are the largest eligible voting bloc in America, but they don't always vote at the rate they should because they don't feel like the system responds to them," Aleigha Cavalier, spokeswoman for Steyer's NextGen America PAC told the Free Beacon by email. "Making sure young voters understand the collective power they have at the ballot box and getting them to show up is key to taking back the House and other progressive victories in 2018." 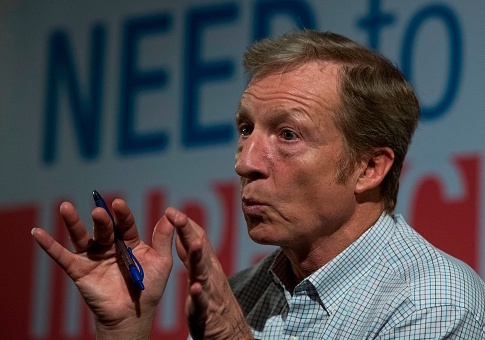 NextGen's stats show they've registered just over 50,000 new voters in Florida, a state where Steyer has also made large financial contributions to the Democratic nominee for governor, Andrew Gillum. The group is just a few hundred registrations shy of crossing the 40,000 mark in Michigan, which could be consequential given that Donald Trump narrowly won the state by about 10,700 votes. All of the numbers provided were said to be up to date as of Oct. 8. 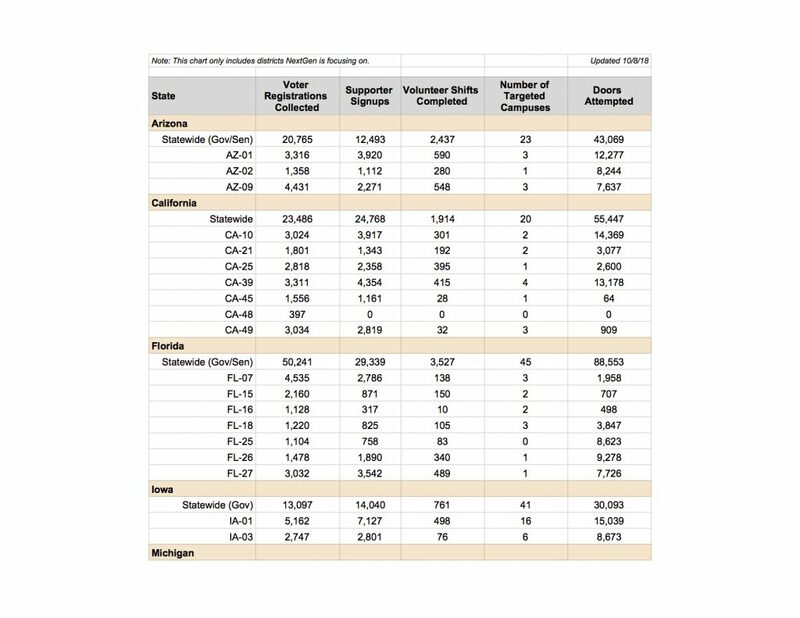 Even though NextGen's registration efforts have a clear emphasis on swing states, the group has also made a push in solidly blue California at registering voters in seven house districts, five of which are listed as being "Republican Toss Up" seats as rated by the Cook Political Report. 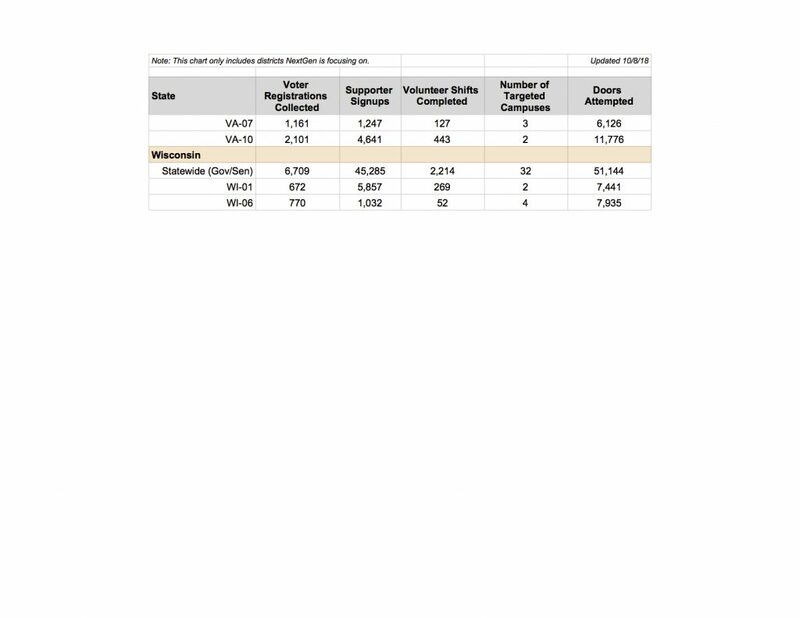 For example, NextGen reports they registered 3,311 new voters in California House District 39, which is an open race due to the retirement of thirteen-term Republican Ed Royce. The district voted for Romney by about a 4 percent margin in 2012. But that Republican advantage shifted dramatically to an 8.6 percent vote in favor of Hillary Clinton in 2016. For several months, numerous media reports have made mention that NextGen is also making a significant investment in Wisconsin, with organizers "across 35 campuses," according to the Wisconsin Leader-Telegram in Eau Claire. NextGen's own numbers show activity on 32 campuses. 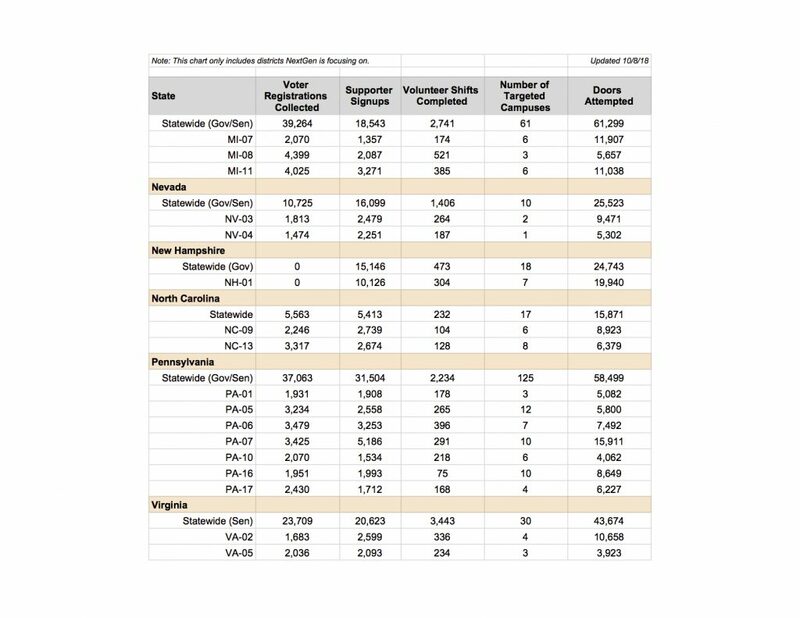 However, the NextGen report shows only 6,700 voter registrations thus far after having knocked on about 51,000 doors. Below is the full data table NextGen supplied to the Free Beacon. This entry was posted in Politics and tagged Democratic Donors, Democrats, Tom Steyer. Bookmark the permalink.